Habitat: Grass and scrub lands but have also been seen in city parks and residential neighborhoods. Sexing: Although the male and female are similar in appearance, there are some subtle differences. The male has a wider bib, the head of the female is slightly darker, and the beak of the male is slightly wider. Many say the mature female will have a slightly lighter colored bill. The male will puff out his chest feathers while singing. Breeding: Easy. A nest, some nesting material, and they should take care of rest themselves. They can be scared off the nest easily by meddling humans or other finches. Social: Yes. 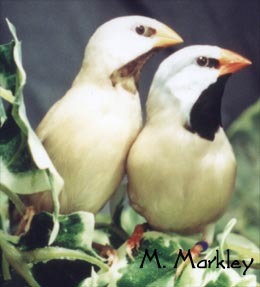 Among their own species and in a mixed flight or aviary with a few other finches. Housing: The Shaft-tail does well in either a flight cage or aviary setting. They do well in either small colonies or mixed flights with finches of equal size and temperament. Diet: A standard finch mix, cuttlebone, oyster shell, fresh water. I give my Shaft-tails a variety of sprouted seeds plus a mixture of greens & egg food. They are fairly eager to try new food. Also plenty of good Spray Millet.